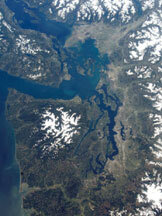 Over 4 million people live around the islands and rugged shorelines of Puget Sound, on the Northwest corner of Washington State. The sound is also home to thousands of invertebrate species, 200 species of fish, 100 species of sea birds, and 26 kinds of marine mammals. Of these species, salmon and killer whales are the most iconic and culturally important to the native tribes of the region. Born in streams, salmon head to the open ocean as juveniles, spend a few years in the sea, and return to their birth streams to spawn. 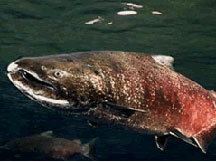 Puget Sound was once surrounded by salmon-bearing streams that had seemingly limitless supplies of salmon. Now, many populations of salmon in the region are declared threatened largely because urban development has eliminated salmon’s crucial habitats. The drastic decline of salmon partly contributed to the decline of the killer whale, which relies on healthy populations of salmon for food. Other factors that caused the killer whale population in Puget Sound to dwindle likely include pollution, the capture of killer whales for marine park entertainment, and disturbance due to whale-watching operations. Puget Sound is home to three resident killer whale pods, named J, K, and L pods by reseearchers. 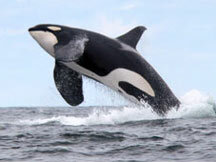 Today there are 89 killer whales in Puget Sound, commonly seen from late spring to early fall. In 2005, Puget Sound’s resident whale population was listed as endangered under the endangered species act.